Being a Chuggington Conductor I will always be able to get you the latest and greatest news and updates on our friends Please tell me you and your kids have tuned into the great new hit Chuggington! 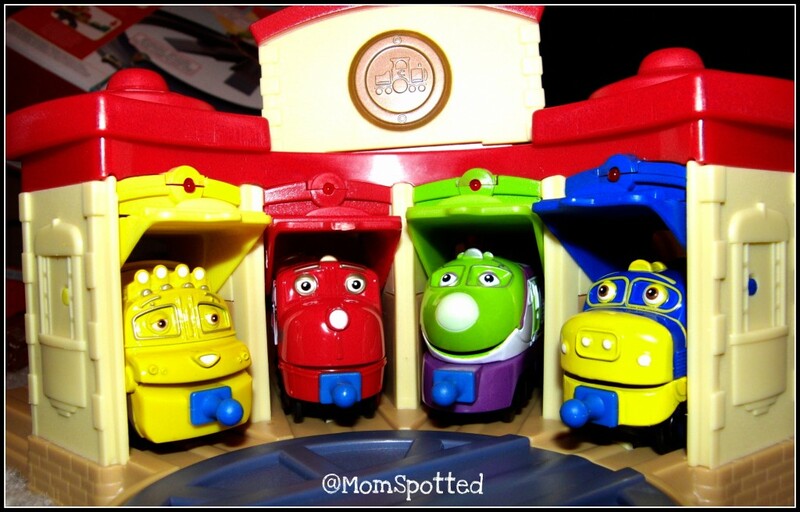 You can find Chuggington on PlayHouse Disney every morning at 6/5 C. Since we’re not watching TV at that hour I often set my DVR to record the episodes as we love Chuggington in our home! 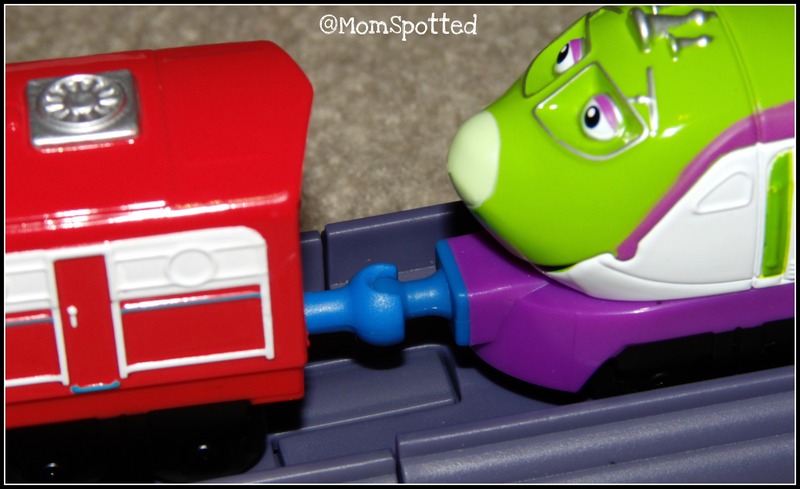 I’m really excited about telling you that you can now buy Chuggington Toys! I was recently sent the Chuggington Launch & Go Roundhouse Playset, Chuggington Straight and Curved Track Pack, and three of the die-cast Chuggington trains! Gavin was so incredibly excited about these toys. I could hardly get him to let me take the above picture. Normally I make sure all my photos are clear of hands and toes but with these toys it was purely impossible. The funny thing was not only with my four year old but my nine year old too! We were able to set up the Chuggington Launch & Go Roundhouse Playset within five minutes. The batteries aren’t included so if you’re planning on giving this as a gift I highly recommend picking them up and including them although this playset can be played with without the batteries too, you just won’t get the extra bells and whistles. The Roundhouse can hold four trains at once. It just so perfectly matched the four trains we received. When the trains push the doors open the lights go off and a you hear the train pull their whistle. We love how cheerful and colorful the set it! Aren’t these trains adorable? I love how cheerful they are! They all have big smiles across their faces! The trains themselves connect easily by just attaching them front to back and have a pretty good grip once together. Your child can easily pick the toys up linked together and carry them without breaking but also easily pull them apart when they no longer want them together. The only complaint I have with these trains is that their names aren’t on them anywhere. I think it would be great to tag their name on the bottom so your child can learn the trains they aren’t as use to seeing. We received Koko, Wilson, Mtambo, and Brewster were the trains we received but with the love Gavin has shown for these they will definitely be under the tree this Christmas season! The Wilson Chuggington Carry Case looks like a great idea along with a few trains. I know Gavin would love to have a few trains and the Chuggington Training Yard Loop Set! Gavin’s favorite part of the set is launching blaster. Simply pop the train of choice in and pound down. You can also easily rotate where it launches from by sliding it from behind. The extra pieces are great for making fun tracks that can wrap around the roundhouse. If you and your child can’t get enough of Chuggington you need to download the latest iPhone ap! Click here to download your chuggington iTunes ap! 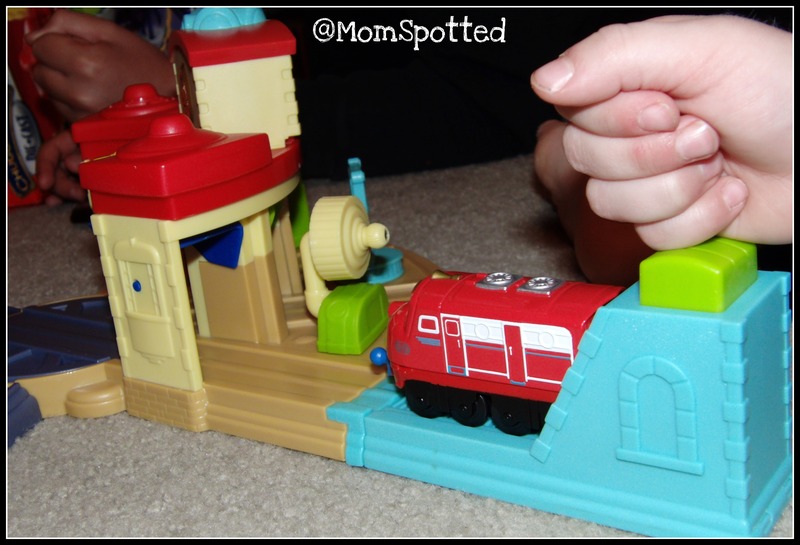 Chuggington has offered a Mom Spotted Reader a Chuggington Train Prize Pack that includes the playset, extra track, and three trains! 1.) Visit Chuggington and tell me what else you like of theirs!! 4.) Blog about my giveaway- with a link back to here AND Chuggington 2 entries(get one more if you include a photo of the giveaway). 6.) Follow Mom Spotted on Twitter. 8.) Become a Fan of Chuggington on Facebook! – Leave a Comment! That’s many chances to win a Chuggington Train Prize Pack!!! Contest ends November 8th at 11:59pm! My nephew would LOVE this! The Fill Wilson Pack is cute! I’m a Chuggington FB fan! My little guy LOVES Chuggington! He also picked out the Training Yard with Bridge Playset. I like the Chuggington Book: Delivery Day- my son would love it! My son would LOVE the training yard set with the bridge to jump over. My son loves Chuggington and this is now on his Christmas list! 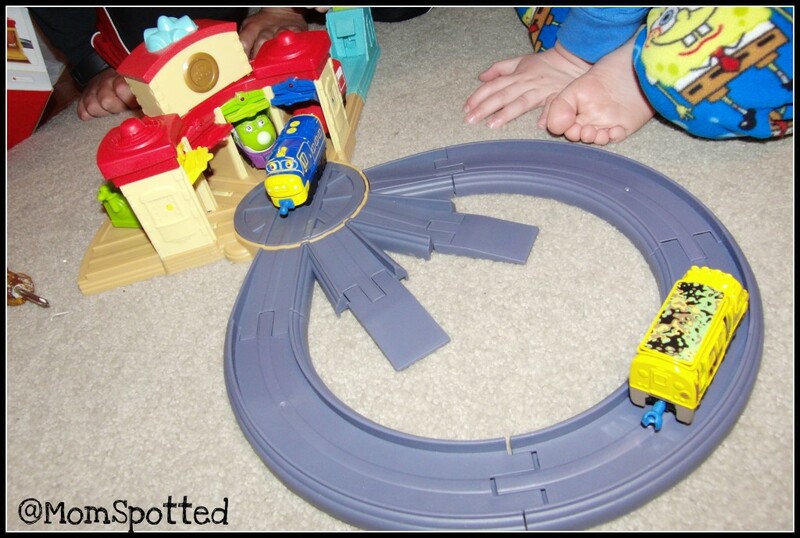 I am a Fan of Chuggington on Facebook! Another product I like is the Fill Wilson Pack! The fix and go repair shed is too cute! I like the Fix and Go play set. Cute! The Ultimate Chugger Pack is awesome!! I’ve never heard of these but my son would LOVE them!! Awesome Giveaway! as well as the train set. I follow @Chuggington on Twitter as 2Cats2See and I tweeted. I like Chuggington Book: Delivery Day. Fan of Mom Spotted on Facebook too!! the pork roast sounds delicious! I like the Chuggington Book: Delivery Day. Thanks. like chugginton on facebook and left a comment that i entered your giveaway. I am Chuggington’s facebook fan. I like the trainie pack best! I like their Train Yard with Bridge! Following Chuggington on Twitter and tweeted giveaway! Chuggington FB Fan and left comment! I love the Training Yard with Bridge Playset. My boys would love this. They would also love the Frostini Chugger Pack. I like the Training Yard & Bridge Pack . My son would love the Chugger Action Pack. I love the Fix and Go Repair Shed playset! I love the colors on it! Love the fill Wilson Pack! My grandson loves Chuggington and he carries his toys around with him so he’d love this. Already a follower my friend – and love the new look! Following Chugginton on Twitter @ThisLittleFam and I tweeted. We would love to have the Fix & Go Repair Shed Playset also! I like the Training Yard with Loop Playset. I like the Fill Wilson Pack..very neat! I get your e mails. I LIKE Chugginton on Facebook. We’d love to have the Training Yard with Bridge Playset! Facebook fan of Chuggington & left comment. 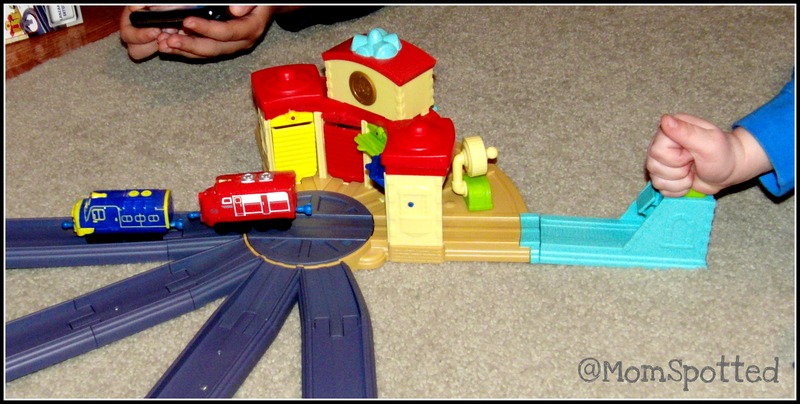 I blogged: http://www.lilybeandesigns.net/2010/10/chuggington-playset-giveaway.html With a picture! I love the fix and go repair shop! I like chuggington on FB! i love the training yard with loop! I like the Fix and Repair Shed playset!! I also love Chuggington’s Fill Wilson Pack. Thanks for a fun giveaway! There is a loop! A train track loop! For Chuggington! I love that. My son is OBSESSEd with trains and Chuggington is a MUST at our house!!! I subscribed via the google friend connect! Honk your horns!! Here we go: My boy would so love the Ultimate Chugger Pack!! He is a fan of Chugginton! His fave is Koko!! He loves running around the house yelling GO KOKO, GO KOKO! lewalk@hotmail.com Leah Walker lewalk76 on Twitter. I visited the Chuggington site and really like the Fix & Go Repair Shed Playset. It’s so cute. I could see MYSELF playing with that, lol. I am following your blog publicly on Networked Blogs. I tried to follow you on GFC as well but it said it was having problems right now. Btw, the link above doesn’t take you to her page. You have to search it. Or I did anyway. I follow Chuggington on Twitter. I also tweeted about the giveaway. I sent Mom Spotted a friend request on Facebook. I commented on the Rachel Ray pan review. Good review by the way. You made me want to run out and buy one right now. Lol. I love the Fill Wilson Pack at the Chuggington website and the DVDs! I can’t afford christmas this year, so I’m hoping to win a lot of toys for my kids. This is perfect for my toddler she loves trains! I love the Fix and Go Repair Shed Playset. I am a fan of Chuggington on facebook. My kids have already been asking for this for Christmas! I’m sure they’d love any and all of the play sets. I think they’d also really like the Training Yard with Bridge Playset. Follow Mom Spotted via Twitter. We like the Fix and Go Repair Shed, too! my son asked for this for xmas! i also love the training yard with bridge playset! My son loves Chuggington. The Fill Wilson Pack is super cute! My children would love this and any of the wonderful items chuggington has to offer! The Remote Control Wilson with Engineers Cap looks like fun! I think my son would like that! I am publicly following your blog! I signed up for email notifications from your blog!! I added Mom Spotted as a friend on FB!! I became a Fan of Chugginton on FB! I also like the Trainee Pack. We like the Training Yard with Bridge and Playset. Saw Chuggington for the first time today with my four year old. We usually watch Mickey Mouse at 12:30 but the scheduling must have changed. He like it. I am a fan of Chuggington on Facebook (Tori Lee Rolfsmeier) & I commented that you sent me there! I am so excited that the toys are now available. I will def. have to get some for my 2 youngest for Christmas. They would both LOVE Remote Control Wilson even better that it comes with the hat. I follow Chuggington on Twitter and I tweeted. My little guy would love the Delivery Day book…or anything Chuggiongton for that matter! I like the Mtambo Chugger Pack. I like the fix and go repair shed set. I think my grandsons would like the Fill Wilson set or the Fix & Repair shop. I receive your email updates #1.
love the fix and go repairshed. disregard answer #746..it’s a duplicate…sorry!!!!!! Here is my extra entry for voting on your facebook halloween photo contest! I love the Fill Wilson pack! (sorry about the above comment–I had actually already entered this contest–so, the mandatory comment wasn’t necessary [although it is true–love Fill Wilson!] Here’s my daily tweet for another entry. Thanks! I became a FAN of Mom spotted on Facebook. Your blog is fun and informative. Thanks you for sharing. I became a fan of Chuggington on Facebook, commented on their page and mentioned your giveaway while there. I signed up for your newsletter and look forward to gleaning from your wisdom and experience. The Fix & Go Repair Shed Playset looks pretty cool. I like momspotted on facebook. I (aka my son) like the Training Yard with Loop Playset. I’m a follower on your blog. #1 – I blogged about your giveaway. #2 – I blogged about your giveaway. #3 – I blogged about your giveaway. I’m following Mom Spotted on Twitter (deanna_j). I’m a Fan of Chuggington on Facebook and left a comment (Deanna Devendorf McClellan). I like the Fix & Go Repair Shed Playset! Chugginton Facebook Fan! (Sheila Hickmon) I left them a message! I like their Training Yard with Bridge Playset. I think my nephew would love it. I follow your blog through Google Friend Connect . I have your new button on my blog’s left sidebar. Did Bonus entry #1, Liked photo. Did Bonus #2 and left comment of Halloween photo. I commented on the boys costumes – my first free extra entry. I liked Gavin’s picture on Facebook and made a comment too My second free extra entry – thanks so much! a Fan of Mom Spotted on Facebook! I voted and commented on your halloween photo for the extra entry.